According to the Bureau of Labor Statistics, about 50% of small businesses fail in the first four years. Today, over a third of the U.S. working population is employed at business with less than 100 employees. Our economy is driven by small, private businesses - only 1% of U.S. businesses are publicly traded. What do small business need to do in order to grow and be successful? 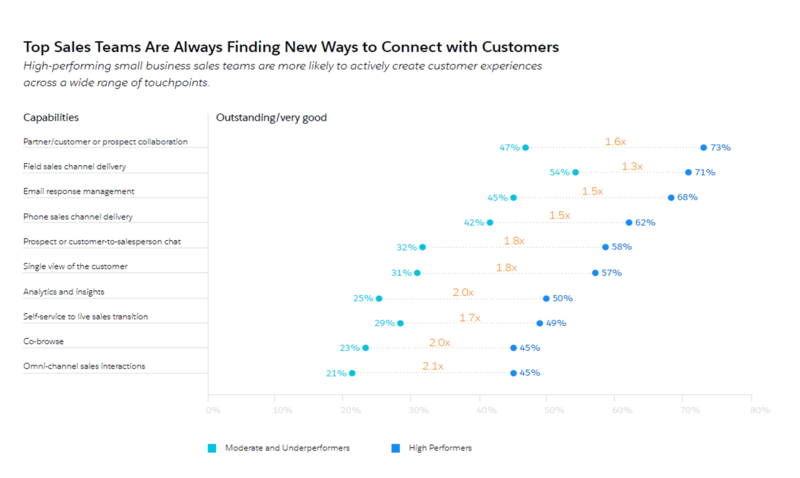 To answer this very important question, Salesforce research connected with 3,800 small business leaders - sales, services and marketing - to gain further insights on customer success. 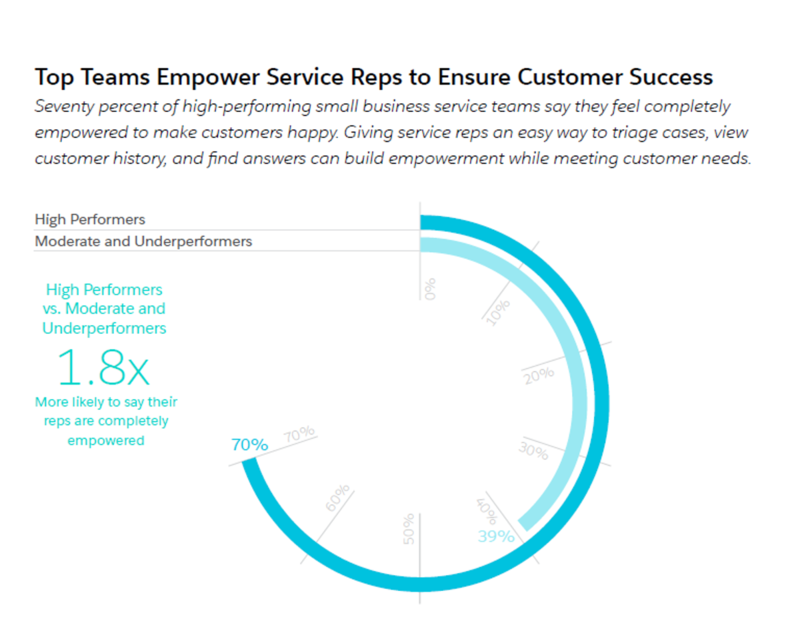 Based on this research, certain patterns emerged to best characterize high-performance small business teams, defined as those that most consistently keep up with customers' changing expectations for sales and service. Mobility drives agility and efficiency - Top small business sales and service teams use mobile technology to improve agility and efficiency. By 2018, small businesses expect to see triple-digit-growth in mobile apps, aimed at improving the customer experience. Data driven customer-centric decisions - Successful small businesses are adopting data and analytics to drive customer-centric decisions. 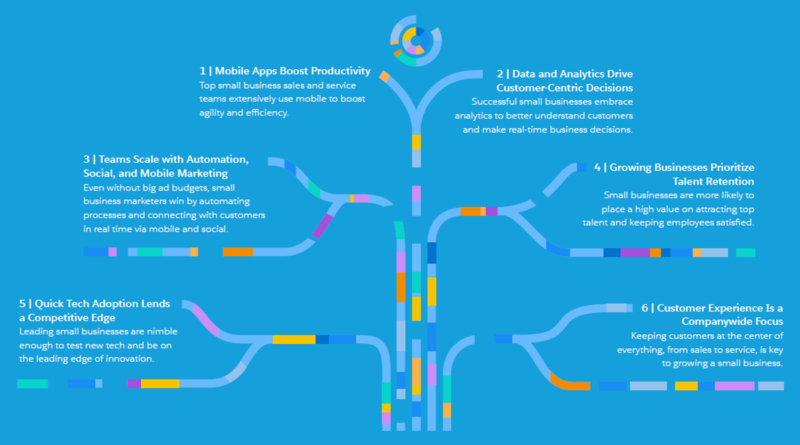 51% of small business marketers rate analytics as absolutely a critical requirement to better understand customer journeys. Small businesses are leveraging analytics for prospecting. 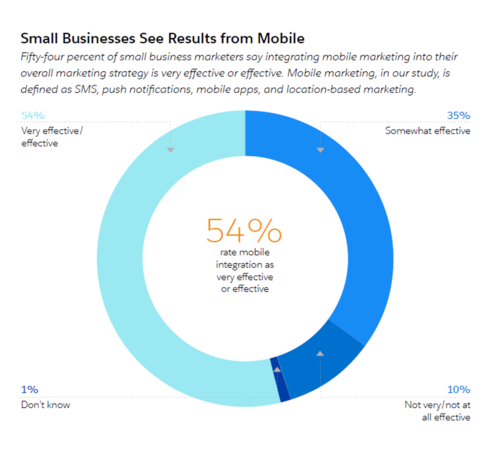 Automation, social and mobile marketing drives scale - Small business marketers are scaling their efforts and increasing brand awareness by using automation, social and mobile marketing. 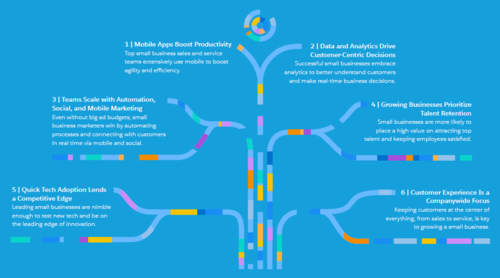 Adoption of marketing automation in small businesses is expected to grow by 143% by 2017. Talent wins - Growing small businesses prioritize talent retention to a higher degree than large enterprise. 42% of small businesses report employee retention and satisfaction as extremely important, as compared to 35% in the enterprise. Tech savvy business gain a competitive edge - Early tech adopters are gaining a competitive advantage. High-performance small business sales and services teams are most likely to be early tech adopters. Marketers lead the charge with 34% identifying themselves as heavy tech adopters compared to 29% in sales and 22% in services. Customer experience is a companywide focus - Top small businesses ensure the best possible customer experience across all touch points. Hera are 20 key statistics to support the key benchmark findings, based on 3,800 data points gathered from small business leaders in sales, services and marketing. 1. Small business use of mobile apps for salespeople will grow by 140% by end of 2017. 2. Small business use of mobile apps to assist customer service roles will increase 219% by end of 2017. 4. 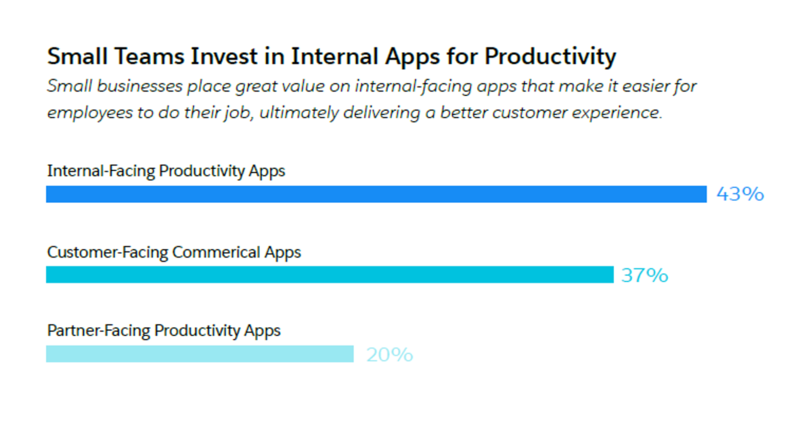 Only 18% of small business sales team and 13% of small business service teams report having mobile apps for employee use, compared to 30% (sales) and 32% (service) among larger companies. 5. Top sales teams are 2.9X more likely to rate mobile sales capabilities as outstanding, while top services teams are 3.5X more likely. 6. High performing small businesses are 1.3X more likely use sales analytics as compared to moderate and underperforming teams. 7. Top small business sales teams are 2.2X more likely to be using sales predictive analytics. 8. Top small businesses service teams will increase the use of predictive analytics by 139%. 10. 62% of small business marketers plan to increase spending on marketing automation substantially or somewhat. 11. 54% of small business marketers are integrating mobile marketing into their overall marketing strategy. 12. 52% of small businesses that use social media marketing view it as a critical enabler of their products and services. 13. 42% of small business sales teams report employee retention and satisfaction as extremely important. 14. 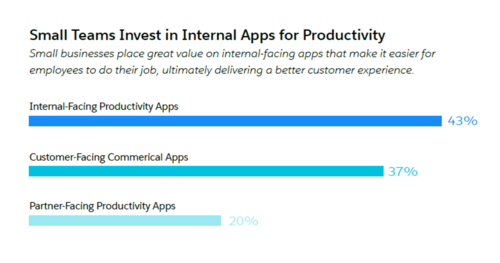 52% of small businesses will increase their budgets for productivity apps over the next two years. 15. 34% of small business marketers are heavy tech adopters, versus 29% of sales and 22% of services. 16. 34% of marketers view predictive analytics as critical or very important in creative a cohesive customer journey. 17. 65% of IT leaders at small businesses currently empower business users to solve problems using tech tools. 18. 41% of high-performing small business sales teams report being heavy teach adopters. 19. 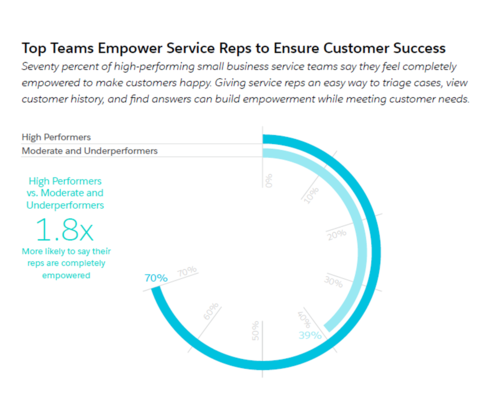 70% of high-performing small business service teams are completely empowered to make customers happy. 20. 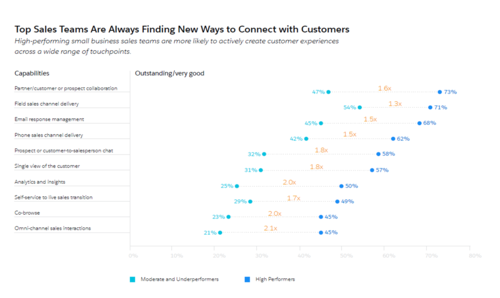 Top performing small businesses sales team have over 10 methods of connecting with their customers. The six benchmarks for small business success further validates the need for small businesses to manage the connected customer revolution. Small businesses can leverage technology and talent to differentiate themselves and successfully grow.